In an age when more than 75% of new patients select their doctors based on online reviews, as healthcare professionals, we must make every effort to ensure that our digital reputations sufficiently reflect the quality of care we provide. Whereas a host of factors, like location and word-of-mouth, are key elements to acquiring new patients, a single negative review online can dissuade a potential patient from visiting our particular practice or hospital. Making matters worse, managing our reputations across multiple social media platforms and review websites can feel like yet another added stress in our increasingly stressful profession. Thankfully, there are a number of innovative companies out there to assist with the complicated business of reputation management for us doctors. We selected these four companies after evaluating the features of their services, direct feedback from their physician clients, ease of use, online reviews, industry reputation, customer service, and pricing. From pizza parlors to automotive repair, Birdeye has proven itself capable of promoting businesses across scores of industries, but their results with healthcare companies are particularly impressive. Striking a keen balance between patient attention and acquisition, the company encourages the use of real-time customer feedback both to drive patient loyalty and to attract new patients. As a downloadable case study from the healthcare organization Healthpointe attests, Birdeye provides a deep and profound understanding of the patient experience for doctors. We don’t need to look further than Birdeye’s own stylish, intuitive website to understand how confident the company is in its reputation management platform. On the website, users are encouraged to leave reviews of Birdeye for all potential customers to see. After more than 800 customer reviews of its services, Birdeye achieves a 4.9 rating out of 5. It’s a good sign that this company is invested in maintaining its own superb reputation. One of the most popular reputation management services on the market, PatientPop is known for its comprehensiveness and its ease of use. Helping healthcare providers make an exceptional first impression by way of a stellar online reputation is a main pillar of the PatientPop practice growth platform. PatientPop helps doctors grow their online reputations, first by claiming and optimizing their listings on business and healthcare directory websites, and then by creating a new website for their practice so they can be easily found in search. PatientPop also helps collect valuable patient feedback through automated patient satisfaction surveys. The surveys invite patients to share their positive experiences online. PatientPop sends all urgent responses directly to providers so they can manage them privately. For doctors looking to quickly modernize both their web presence as well as turbo charge their reputation management, PatientPop is an excellent option. Integrating and compiling data from more than 45 online review sites including Zocdoc, RateMDs, and Healthgrades, RepuGen uses advanced tech and machine learning to focus on what really matters: patient experience. Whether it’s for a hospital or private practice, Urgent Care Centers or IPAs, RepuGen has unique strategies for search engine optimization, automated patient outreach, and systems of notification. RepuGen prides itself on going the extra mile: not only does the service make doctors aware of those rare negative reviews, it facilitates connecting doctors with unhappy patients to assist in retaining them. The numbers speak for themselves: one family care center in Virginia saw a sixfold increase in monthly reviews after signing up with RepuGen, while a medical group in San Juan, Puerto Rico had more than 100 potential negative reviews intercepted in a single month. ReviewTrackers is a cloud-based reputation and review management solution designed for businesses of all sizes. The key features include customized review collection, monitoring, notifications, and performance analytics. ReviewTrackers collects online reviews directly from patients who have just finished their office visit and from third-party review websites such as Facebook, Google, Healthgrades, and Yelp. Users receive a notification when a new review is added. The solution also allows doctors to analyze patient reviews and discover trending issues and topics based on patient feedback. ReviewTrackers offers integration with Hootsuite, which allows users to view reviews in the Hootsuite stream, search reviewers based on customized filters, and publish reviews across different social media platforms such as Twitter, Facebook, and LinkedIn. The solution also offers patient feedback and landing pages, where users can design webpages for review campaigns using templates. ReviewTrackers has an affordable monthly plan, exceptional customer service, plenty of relevant and useful software integrations, extensive experience with healthcare businesses, and is used by over 40,000 companies across the nation. The rise of the internet has introduced more than just a few wrinkles to the doctor-patient relationship, with online reviews being just one manifestation of an ongoing shift in the way we evaluate medical care. While some may see this shift as a step in the wrong direction, it’s vital that physicians approach every review–positive or negative–as an opportunity to improve the patient experience. By using services such as Birdeye, PatientPop, RepuGen, and ReviewTrackers, we are lucky to have so many dedicated services to steer us through the unruly waters of reputation management. Now, the next step is to determine which one of these four excellent reputation management services will be the best for your particular practice and budget. Please share your personal experiences regarding reputation management with our community of physicians in the comments section. 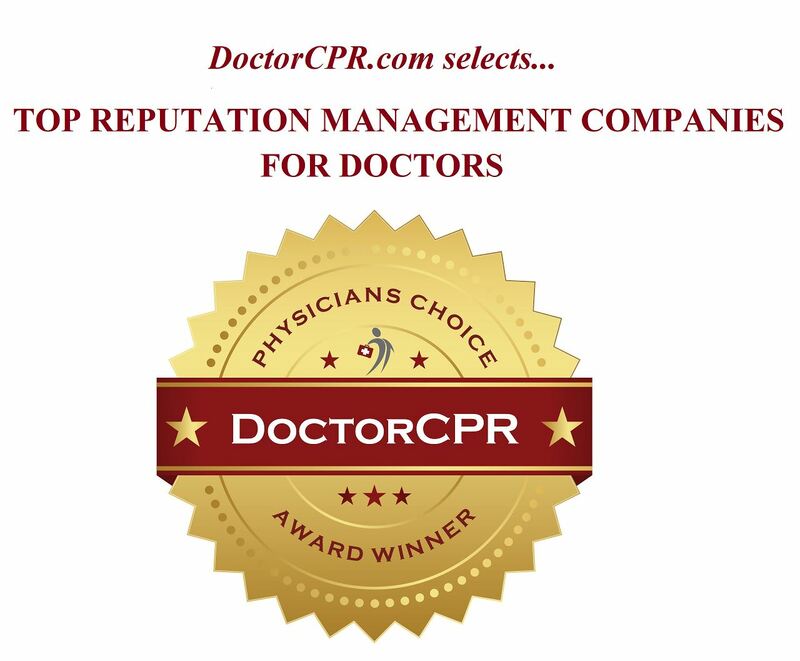 The DoctorCPR Physician Panel–DoctorCPR is America’s #1 Site for Physician Jobs and Practice Resources. Visit DoctorCPR Today! This entry was posted in Advice for Doctors, How Patients Choose Doctors, Medical Practice, Reputation Management, Reputation Management for Doctors and tagged best reputation management companies for doctors, best ways for doctors to market their practice, birdeye, get more patient reviews, how doctors can get better online reviews, how doctors can get more positive reviews, how physicians can get more good reviews, how to get five star reviews for your medical practice, how to get more good reviews for your practice, marketing for physician practices, marketing your practice with more patient reviews, medical practice marketing, negative patient reviews for doctors, patientpop, physicians get more online reviews, repugen, reputation damage control for doctors, reputation damage for doctors, reputation management for doctors, reputation management for healthcare professionals, reputation mangement for physicians, reputation services for physicians, reputationtracker, when doctors get bad patient reviews by Drpost. Bookmark the permalink. This is a very informative topic. I appreciate it very much! Another leading healthcare reputation management software is rater8 (http://www.rater8.com). rater8 is focused solely on helping medical practices enhance patient satisfaction, grow online reviews, and increase their profitability. We integrate seamlessly with all practice management systems which allows us to collect patient feedback in real-time. Practice admins are automatically alerted of any low ratings. And happy patients are routed to the review platform of the practice’s choice. We currently integrate with the top review platforms like Google, Yelp, Healthgrades, Facebook, and Vitals. RepuGen is great as it’s entirely focused on healthcare and offers much more than just reputation management. A practice can even use it for patient retention and recovery, like sending birthday cards to patients and addressing negative reviews immediately! BirdEye http://www.birdeye.com is great for any medical practice that wants to build online presence and reputation. The birdeye reputation management software helps build online reputation and engagement with patients. We have been using it for our urgent care clinic here in Texas and it has really helped our practice in securing reviews and managing our online listings. Good article… Very informative pointed out Services I was unaware of.